Grapes and apples are two commonly eaten types of fruit that are used in many different ways. Although the ways in which these two fruits are consumed are sometimes very similar, such as when they are turned into juice, they are produced by two very different types of plants and they are cultivated in different ways. Apples come in a range of different colors and sizes, but they are typically between two and three and a half inches in diameter, and red or green in color. They are a sort of multiple fruit, with five carpels having joined together to make the apple. The carpels are arranged together in a star-like shape at the center of the apple. Each carpel usually contains one to three seeds. Grapes are berries that grow on woody vines in clusters of between ten and 300. Although they would naturally contain a seed, some seedless varieties have been cultivated. 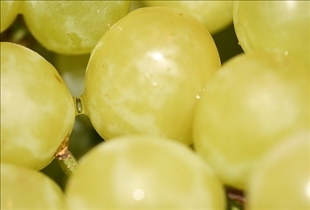 Grapes come in a range of different colors, with green (sometimes called white) and purple (or red) grapes being the most common. Wine grapes are usually smaller than table grapes and they have thicker skins. Apple trees are classed within the genus Malus. They are one of the most widely cultivated fruits, with more than 7500 different varieties. Some varieties are sweeter and they are intended to be eaten raw (as dessert apples), while others are more sour and are intended for use in cooking. The apple originated in Western Asia and was one of the first species to be cultivated. The importance and long history of apple cultivation and consumption is reflected in the many appearances of apples in mythology. Today, about 55 million tons of apples are cultivated annually, with over a third produced in China. The industry generates about 10 billion dollars a year. Grapes are woody vines of the genus Vitis. They were first domesticated in Turkey, with records of grape cultivation occurring in many ancient civilizations including the Greek and Egyptian. Cultivation originally involved growing purple grapes for wine production, but a range of different cultivars are grown today. About 71 percent of grape cultivation is still for wine production, with some parts of the world including areas of Spain, France, Italy, Chile, Iran and the US being renowned for their wine. Apples are often eaten fresh and raw. Sweet, mildly acidic varieties tend to be preferred as dessert apples. Apples can also be juiced, canned, made into cider, dried or cooked. 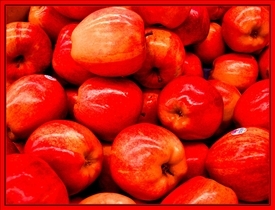 They are often used in desserts such as baked apples, candy apples, apple pie and apple crumble, or eaten as apple sauce along with a sweet or savory dish. Apples are a healthy fruit, although the sweetest varieties do contain a lot of sugar and the acidic nature of the fruit can contribute to tooth erosion. Some scientific evidence has suggested that apples may help to prevent cancer and heart disease. They are rich in antioxidants and fiber. Grapes can also be eaten fresh (as table grapes), but they may also be used to produce grape juice, jelly, jam, vinegar, grape seed oil and extracts, wine or raisins. Grapes have been associated with a number of health benefits, including the reduction of cancer risks and improved cardiovascular health. Apples and grapes are two very different fruits that have been cultivated in various varieties for many centuries. Each fruit has been linked with important health benefits, although they are still primarily eaten for their taste. Apples grow on trees, grapes grow in clusters on vines. Dessert apples are eaten raw, cooking apples are cooked. Apples are usually eaten fresh, baked, stewed, juiced or cooked. Table grapes are eaten raw, wine grapes are made into wine. Grapes are usually eaten fresh, juiced, or dried. Fermented apples make cider, fermented grapes make wine. This was a great help!I'm doing a science project on it and this really gave me all the answers.